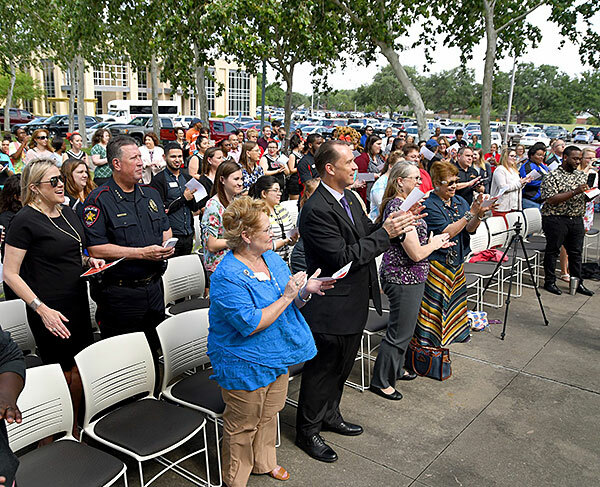 UHV faculty, staff and students, and area community members applaud Wednesday as they hear the university’s alma mater sung for the first time at Pyramid Row. For the first time in the University of Houston-Victoria’s 45-year history, the university has an alma mater. The school song was revealed during an event Wednesday morning at UHV Pyramid Row. Development of the alma mater started with UHV students, and the process became a collaborative effort between UHV students, faculty, staff and alumni who were part of an alma mater committee. Developing an official UHV alma mater began in 2017 as a Student Government Association initiative, said Michael Wilkinson, director of UHV Student Life & Services. The alma mater will be taught to new students during UHV’s welcome weekend, Jaguar Journey, Wilkinson said. It also will have a significant place at other key events throughout the academic school year, including UHV’s May 12 commencement ceremonies. Teaching new students the song as soon as they set foot on campus, and then reinforcing it throughout their time at UHV, will help cement the new tradition for years to come. The alma mater is another tradition that ensures alumni would be proud of their UHV Jaguars' family, said Alvaro De La Cruz Student Government Association president. UHV junior Cassie Cameron performed the new song at the UHV Alma Mater Reveal and will sing it at the May 12 UHV commencement ceremonies. Students, faculty, staff and community members were given a handout with the lyrics and sung along after Cameron. This was the first time the alma mater was sung in a public setting. Tall and strong and true. Fear our pride and might. They who seized the day.